Real Estate Appraisal - home appraisal - Comp Checks and Market Analysis. What is a comp check? At Good Faith Appraisals, a "comp check" is called a Market Analysis...and we do them! A market analysis is a report that gives the client a value range for similar homes in a given market at a given time. 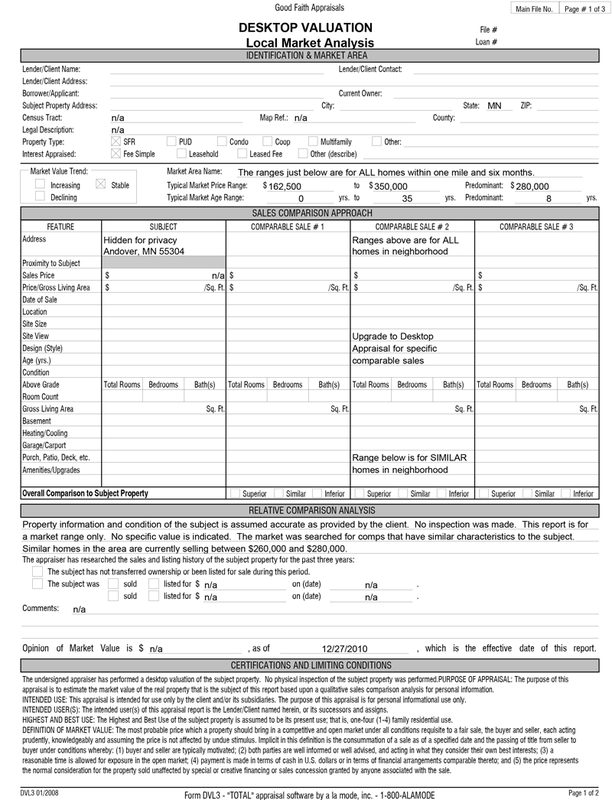 For example, the finished report will not have an appraised value like $175,000. Instead, it will have a value range, for example $160,000-$195,000. The client description on the condition, size, and other amenities of the subject property will determine where the home would fall in that range. This is the legal way to perform what used to be called a comp check. Before the market crash in 2006, and new government regulations, comp checks were common. In the past, a lender would call an appraiser and ask "What will this house appraised for?" The appraiser would sometimes send back a range based on the neighborhood, also with assumptions about the subject property. It is perfectly legal for an appraiser to perform a comp check, or market analysis. It just needs to be treated like a normal appraisal order. Good Faith Appraisals offers market analysis for only $39. See the sample report below. Bedroom and bathroom count, above and below grade seperated. Any questions must be addressed to your loan officer, realtor, or mortgage professional. This is only an opinion of value range by a certified appraiser. This opinion is yours to take into advisement, ignore, or otherwise. This opinion is not subject to discussion, argument, or further comparable consideration. You understand that NO inspection of the subject home was made. The opinion of value range is made with only MLS, county data, or supplied information. If an inspection were made, value range could differ. You understand that this is a very limited product that supplies you with a range of typical home sales in your area. You do NOT receive specific comparable sales. If you need a more comprehensive report, you can upgrade to a desktop appraisal or full appraisal.